Hey! This time I’m going to show you how to play games online in your main account without plus, FREE. To be clear there’s nothing magical or fishy here, we’re just renewing the PS Plus free trial as soon as it expires, with a new email address. 1- First, we log out of the PS4. This can be done by going to the power option. 2- Press the PS Button in your control. You gonna see your user, and left your user the option of “New User”. Select it. Now, you have two options. Select “Create a User” and click the “Accept” button. 4- When you get to the Playstation Network login screen, select the “New to Playstation Network? Create an Account” one. Select “Sign Up Now”. Okay, this is the important part. In the “Country or Region” square, select [size=150]CHINA[/size]. As you see, everything is in Chinese now. You’re going to leave everything as you see in the next images. Select the last button which i guess it means next. 5- In the first one, put 4885. In the second one, put the first. And in the third, put anything. It should be like the image. 6- This screen is an important one. We need to put a email and a password, but, if we put a false email, we cant confirm the account. So, we gonna use a “15 minute email”. The part we of the page is the square that says “Check Any Inbox”. Okay, we’re going to need the pc later. Go back to the PS4. In the second one, put a password. It gotta be with a capital letter, and 4 numbers. Minimum 8 characters. 9- Put a random ID in the first one. In the second one a random name. Gotta be like this, hit next. 13- After that, you gonna get this weird screen. Hit the right button. 14- Kay, almost finish. Go to the mailinator page and reload your inbox. The email Sony just send gotta be there. Open it. Click the blue button, it will open another page. Now that the page was opened, we finished in PC. Back to PS4. 15- You gotta be in a page with a mail image. Select the right button, and it will get you to another screen with another email that has a check. Cross to go next. 16- Now you are in a facebook page, select the left button which i guess it means skip. 17- Now you are in a PS+ page. Everything is in English, thanks god. Hit next. 19- IMPORTANT ONE SELECT THE “ACTIVATE” BUTTON, IF YOU DON’T DO THIS YOU CANT PLAY ONLINE IN YOUR MAIN ACCOUNT. 21- Now, you are in a home screen. Go to “Settings”, it is left the power option. 24- You’re going to be in this screen. Select the first option. 25- Congrats! Now you’re plus. 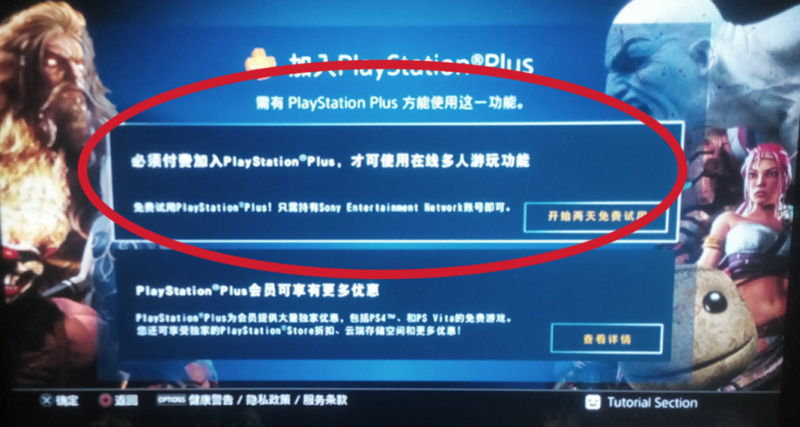 Press the PS Button to go to the main screen, and log out of the user and select yours. Now, even if you aren’t plus in your main account, you can play online.